The NYPD is becoming its own telco carrier, the third largest such network in the city and the only one not owned by a telephone company. Eagle-eyed NYPD Transit officers arrested a man wanted for a Brooklyn burglary pattern after they recognized him from a photo that was distributed on their Department issued smartphones. Last month Sergeant Hayes along with Police Officers Patel and Bereznyak were on patrol when they noticed a man walking along a subway platform. The officers knew the man matched the description that was broadcast to their NYPD smartphones the previous day. They determined the man’s identity after speaking with him and placed the 27-year-old man under arrest for multiple commercial burglaries. This is just one example among thousands that prove the NYPD is on the cutting edge of its use of technology. The Department is continuously integrating leading edge technology into all of our operations. The department is known the world over for revolutionizing policing with the institution of CompStat, its weekly crime-fighting and accountability sessions fueled by continually evolving electronic mapping and data-display technology. Working with Microsoft in response to the attacks of September 11th, the NYPD also developed the Domain Awareness System (DAS) which pools streams of data from live closed-circuit television feeds, 9-1-1 calls, license plate readers, environmental sensors, mapped crime patterns, and other sources. A formidable deterrent to terrorist acts, DAS is one of the world’s premier systems for monitoring and protecting a dense urban environment. During the past three years, the NYPD Information Technology Bureau (ITB) has been rebuilding the department’s technology networks, including a new phone system, a new radio system, and a fiber optic network connecting all NYPD facilities. 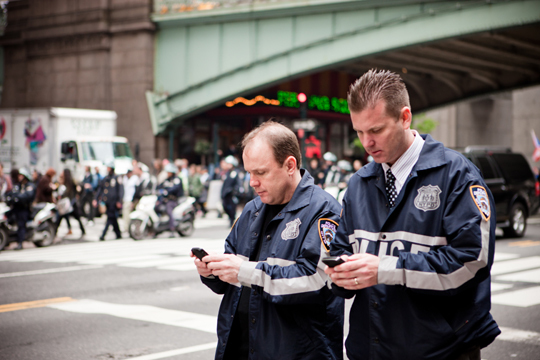 In effect, NYPD is becoming its own telco carrier, the third largest such network in the city and the only one not owned by a telephone company. In 2016, our Information Technology Bureau put the finishing touches on a new datacenter in Brooklyn and brought the new Public Safety Answering Center (PSAC 2) online in Bronx, providing a second primary call answering center and full redundancy in event that either center is disabled. ITB also expanded the NYPD’s cloud utilization, ensuring greater geographical diversity for NYPD data storage. In the interest of opening NYPD data to the public, ITB developed CompStat 2.0, a public version of the CompStat crime report, with information about crime and enforcement activity in every precinct. Also online for the first time are the NYPD’s public accident reports, which used to only be available at precinct facilities. “We are building out a reliable, secure, high-bandwidth, redundant tech infrastructure, and we are developing an extensive suite of applications to go with that infrastructure,” said Deputy Commissioner Jessica Tisch, who manages the NYPD Information Technology Bureau. Perhaps most notable of all, our Technology Bureau has decentralized police communications by equipping all 35,000 officers with smartphones and 2,000 patrol vehicles with tablets. These instruments not only provide officers with direct lines of contact—by phone or email—to the communities they serve, but also allow them access to a variety of highly useful data tools while in the field and on-the-go. With their department phones, officers can now access real-time 911 data, including history of previous emergency calls made from the same location and any wanted individuals associated with the address. Often, they are receiving the 911 jobs faster on the phones than the jobs can be dispatched by radio. Officers also have full access to the NYPD Crime Information Center, where they can check warrants, search for information about wanted or missing persons, and view all Crime Stoppers information, only a click away. Using a phone application called Translator, officers can translate 50 of New York City’s most prevalent foreign languages, whether spoken or written. The city is a vast melting pot, and Translator provides a much needed tool to officers working in some of the most diverse neighborhoods in the nation. The phones support neighborhood policing by making officers more accessible to the public, and also by enabling more effective communication and collaboration among the cops themselves. Under the neighborhood policing model, at least 12 officers share responsibility for a sector within a precinct: five two-officer teams working each of the three daily shifts with coverage for days off, and two neighborhood coordinating officers. In the past, officers tended to focus only on their own shifts and could not readily communicate with officers on other shifts, especially since most officers did not have email addresses or phones. A recent crime-fighting initiative is the implementation of ShotSpotter, a technology that detects and identifies the locations of gunshots. The NYPD launched a pilot program in 2015, deploying ShotSpotter in several precincts in the Bronx and Brooklyn that were experiencing high levels of violence and gun crime. The technology identifies and analyzes the sound of gunshots using tiny, strategically-placed sensors that immediately triangulate the location of the shots and send data and audio to ITB’s Domain Awareness System (DAS). The Chief of Department’s Operations Unit dispatches ShotSpotter alerts to patrol units in the field. ShotSpotter technology is built in three-square-mile increments, with each square mile containing about 60 sensors. Each sensor functions, essentially, as a computer, using microphones that ignore ambient noise, and time stamp loud, explosive noises down to the millisecond. The sensors contain GPS chips that provide precise information regarding the locations of possible gunshots. ShotSpotter Technology, Inc. provides a monitoring review service—24 hours a day, seven days a week—to which all possible gunshot recordings are sent and where they are reviewed by trained audio experts, capable, in some cases, of determining the number of shooters and types of firearms. These experts relay all vital information back to the department and to officers on patrol. Between 75 and 80 percent of shots-fired incidents in New York City go unreported, so ShotSpotter is adding another critical component to the ongoing effort to control gun crime. Shots fired are often indicators that shootings, and possibly homicides, will follow in the same general locations. ShotSpotter alerts allow officers to move swiftly to scene of shots fired to suppress further violence, to gather ballistic evidence, to locate relevant surveillance video, and to canvass the neighborhood for people who may have seen or heard something. Any of this evidence might prove decisive when investigators are trying to build a case against gang members or other violent criminals in the area. The department’s deployment of the ShotSpotter technology is currently entering its third phase, and will soon cover 60 square miles of the New York City neighborhoods with ShotSpotter sensors. The neighborhoods covered, within each of the five geographical boroughs, are some of those most affected by gun violence, based on analysis of shooting and 911 data. This is a special report from the Communications Division of the New York City Police Department.